I am going to do my utmost not to turn this post into a rant, but I make no promises. The population in our tiny town explodes from May to October. Cottagers and tourists alike flock to our little oasis to drink from our serene waters, to sip from the fountain of relaxation and to let every ounce of their city stress slowly dissipate until they resemble nothing of their former city-dwelling selves. This is what we are selling and this is what they are buying. This year seems to have hit an all-time high for human traffic. Stores are reaping the benefits of the excess numbers of shoppers, our local Foodland check-outs are all lined up six shoppers deep but I have learned to adjust my shopping schedule accordingly. We get it. We are not new to this phenomenon and we learn to adapt to our new routines to keep our sanity. But there are moments that we cannot control – moments when we have to shop during the peak times and it is during these times I lose my sense of humor. Blatant rudeness and uncaring attitudes run rampant. You may think I am simply frustrated from working long hours and dealing with unbearably hot temperatures, but I have first-hand experience of the uncaring attitude of some of our summer guests. My latest encounter today prompted me to vent write this post. I pulled into the liquor store and was shocked to get a parking spot without having to wait. I noticed three carts left on the sidewalk in front of the store, collected them and returned them to their rightful place inside the store. Wine in hand, I moved to the tills and the line moved quickly. I was lucky to get in and out without incident. The woman who was parked beside me had just loaded her box of goodies into her BMW SUV and lifted her cart up over the curb, leaving it on the sidewalk. I got into my car, made eye contact with BMW lady and then she and I both watched as her cart slowly rolled backwards, tipped over the curb and landed on my front bumper. Not missing a beat, she slid her vehicle into reverse, no apology, not a shred of remorse, backed out of her spot to head back to her restful vacation spot. I could feel my blood pressure rising before the color of my cheeks betrayed me. I got out of my car, checked my bumper and wheeled her cart back in to the store to avoid having this happen to another car. These are the people who frustrate me. These are the people who make me believe that, to them, other people just don’t matter. I may have ranted in an earlier blog and received many varying comments, perhaps rightfully so, but my rants are justified. Ask yourself how you would have reacted in that situation. 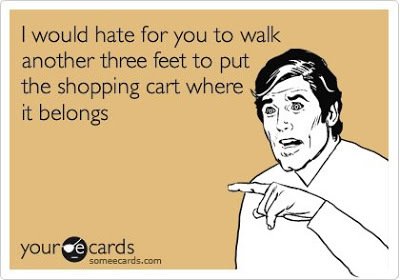 For me, I would never have left the cart in the first place but, I would certainly have jumped out of my car to make sure the other vehicle had not sustained any damage. Rant over. What would you have done?